Making peace with the world, sooneror later most of us have to. But how? For Ian Mac Bride, his way begins almost accidentally when, in 1909, he watches a fly-casting tournament in New York's Central Park, and begins to dream of becoming a great fly caster. But soon Ian experiences personal tragedy, and then is appalled by the unexpected slaughter of World War I. He retreats into the world of fly fishing and fly casting, and meets unforgettable anglers like: Doc, a Civil War veteran, who tells how, after he enlisted in return for drinking money, he was unexpectedly changed by the horror of war; Izzy, a mysterious immigrant, who, in his way, teaches Ian perhaps the most important lesson of long-distance fly casting; and George M. L. La Branche who, though torn by self-doubt, writes the book that revolutionizes fly fishing. And so, these anglers help change Ian's hopes and values. Though his father questions his courage, Ian decides to become a teacher instead of a lawyer, and moves near the beautiful Beaverkill River, the birthplace of fly fishing in America. But tragedy still follows him. Torn by grief, he curses the world and loses faith in it - until, almost by accident, he finds a way to come to terms. How? The answer will surprise you. I'm a native New Yorker.After a good deal of disappointment, I gave up writing. Then my mother passed away, and I found that fishing helped ease my grief. Almost accidentally, I wrote and sold a fishing article. Afterwards, my articles and memoirs appeared in many publications, including The Flyfisher, Flyfishing & Tying Journal and Yale Anglers' Journal. To me, much of my writing is about how the challenges of fishing and the beauty of the outdoors helped me come to terms with loss and with a world I can't always understand. In a sense, my writing is autobiographical, as it reflects my own gratifying, but at times, difficult journey of emotional and spiritual recovery. On the long road of my journey, I slowly learned that, even when I don't have answers, I must strive to find forgiveness and self-worth and to connect to the good in the world. (This is how I define spirituality.) I therefore love books where the main characters struggle against inner and outer conflicts and then try to do what’s right. My most recent book is, The Way of the River: My Journey of Fishing, Forgiveness and Spiritual Recovery. “A maverick and memorable book - I really enjoyed it.” - Nick Lyons, author, Full Creel.“I simply enjoyed the heck out of it." - Eric Peper, coauthor, Fly Fishing The Beaverkill. "An unforgettable cast of characters." - Jim Witty, Bend Bulletin. "The novel is well-written, I thoroughly enjoyed reading it and highly recommend it whether you're a fly fisher or not." - John Pitarresi, Utica Observer-Dispatch. “An engaging tale of a young man coming of age." - Lee Murdock, Fly Fish Magazine. "A compelling novel that describes one fly caster's search for personal peace." - Bill AuCoin, the Aucoin Report. 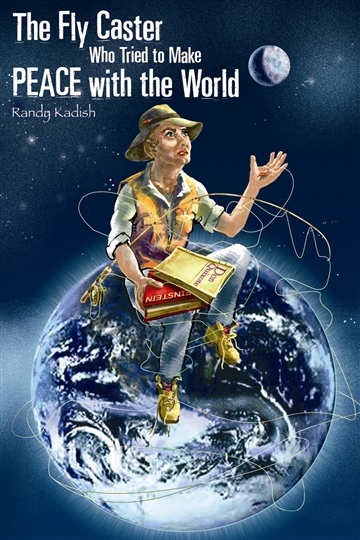 “Great book Mr. Kadish!” - Bill Anderson, Trout Waders blog.